Whooohooooo! We've got a venue!!! And with that, I'm going to leave you at the edge of your seat (for now). I immediately tried it on the sample envelopes I had ordered from Paper and More. I had to stop myself before I embossed all of them. I need to save them for a test run through my printer. I don't think my printer would appreciate nubby paper. For a traditional Chinese wedding, the bride has multiple costume changes. There's the tea ceremony dress (kwa), the church ceremony dress, the traditional Chinese long dress (cheongsam or qipao), multiple cocktail dresses during the reception, and of course the send-off outfit. Back in the olden days, wealthy brides would change up to 30 times! Modern brides change 2-4 times; usually it's the white dress and the cheongsam (for the tea ceremony or part of the reception). If you ask me, more outfits equal more money. Until recently, I'd never been able to make up my mind about whether I'd be a one or two dress bride. I would always ask myself: Why would I want to take off the white dress? How much money is the Chinese one going to cost me? Do I really need two? The answer is yes, I want both. But here's the catch, I don't like the kwa or the cheongsam. The kwa is heavily embroidered and beaded. I imagine it to be pretty heavy and would get hot wearing it, especially if we're having an outdoor wedding in August. The cheongsam is meant to hug your curves (for those that have curves). I've never been one for super fitted clothes. I would also have a terrible time trying to walk in it. While the dress has either one or two slits up the skirt to aid in movement, I'd probably still fall flat on my face. Left: Kwa. Right: Qi Pao or Cheongsam. So what's a girl to do? Any guesses? Come closer and I'll tell you. A little bit closer...closer...OK that's close enough. I'm going to have mine altered to the way I like things. I know, I know, custom made usually means $$$. My friend's mom is a seamstress/dressmaker (she made his sisters wedding gown which was assessed at 20K!) and is excited about the idea. I'm hoping she'll give me the friends and family discount. I've been struggling with the design. I'm no fashion designer, but none of the ideas in my head were working. Then I saw three pictures yesterday and instantly I knew exactly what I wanted. Left: Sarah K Chen. Top Right: Laura Ivanova. Bottom Right: Michele M Waite. We've been telling people that 2/3 of our guest list will be from out of state, but I just realized that it's more like 3/4 of our guests don't live in MA!! Aside from proper wedding etiquette, I really want to make sure that everyone is taken care of. I don't know about you, but after traveling all day, I'm tired, hungry, thirsty, and cranky. Enter Out-of-Town bags. 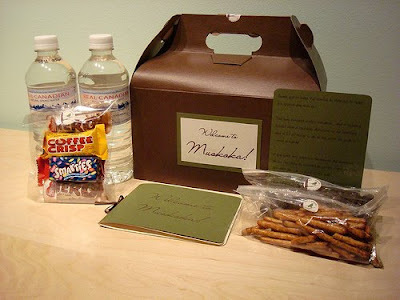 OOT care packages usually greet guests when they reach the hotel and are filled with water, snacks, a welcome note, maps, and tourist information. I recently bought 3400 yards of baker's twine (that's a whole other story), so I'm trying to figure out how to use it up. I'm a baker, I now own baker's twine, Ah HA I got it! I'll use bakery boxes (think cake box) as our OOTs! -The website is terrible, there are no pictures of the inside of the venue or the veranda! -Neither one of us likes this venue. There's nothing much to the grounds from the pictures (big green lawn, then big white mansion). Perhaps it's just bad pictures? -Looks more like a farm house with nice gardens. The grounds strike me as more whimsical. Jake and I loved this place. We thought it was IT. The grounds are gorgeous. The fountain is fabulous. There's an Inn on the same property. Here, comes the BUT...there's no room on the grounds for a tented reception. BOOO!